I don't care about perfection. I live in reality and based on originality, forget looks and respect personality. I could care less about popularity. I live through reality. I base myself on originality. Forget about looks. I respect personality. Anybody can wine and dine, but it takes courage to truly Shine. Be original, be yourself. In trying to become like someone else, we are compromising our own self being. If we are not satisfied with our own self, can not find satisfaction anywhere. We should learn to keep our own self happy and remain happy under all circumstances in life. The key to being happy is a non-insisting mind, non-complaining mind, and a pure mind. If you want to be average, do what others do. If you want to be awesome, do what no one does. Being unique is better than being perfect! If you don't design your own life plan, chances are you'll fall into someone else's plan. Be yourself no matter what other people think. God made you the way you are for a reason. Besides an original is always worth more than a copy. 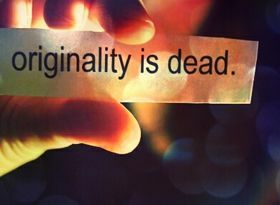 Originality is essential to man because each human is unique and has the capability of being original in everything. All good things which exist are the fruits of originality. Even if the originality is not appreciated by others, it is better to stay so because you will at least have the satisfaction of being original. “It is better to fail in originality than to succeed in imitation” said Herman Melville. We should make sincere attempts to retain originality and it will give us a lot of confidence, courage and helps to stand apart from the crowd. “The merit of originality is not novelty, it is sincerity” are the words of Thomas Carlyle. If the memory serves good it is not difficult to retain originality. This is particularly useful and in fact essential for writers, artists, players and those in the entertainment field. Read these quotes on originality given by various leaders.